Mortem Veland is a very well known name in the metal scene, former guitarist of Tristania, he began his adventure under the name of "Master of Sirenia" around 2001, soon shorten the name to "Sirenia" and from then a lot of people around the globe has known his path, talented musician has crafted a singular and reliable sound which define his career, alongside with the Spanish Ailyn a classical singer, her voice stands out for the charming and sweet melodies, her presence on stage is undisputable, there is no doubt, both are the perfect to each other. Sirenia has been through some line-up changes overs the years, but seems like they has now settled with a fixed and strong line-up, Jonathan A. Perez taking over the drums and Jan Erik Soltvedt as lead guitar. 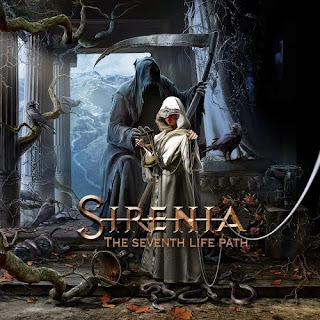 Less than two years ago, Sirenia released their album "Perils of the Deep Blue" which has a really good reception between fans and media, setting up a great expectation to the following album, I think this time they choose to follow a safe path and their newest release "The Seventh Life Path" surely accomplished what they have in mind perfecting their sound, captured in their previous record "Perils of the Deep Blue" a mixture of Gothic metal and classic orchestrations adding some traces of extreme metal genres, here they have powerful drums, rhythm guitars, atmospheric keyboards, terrific bass, vocals are versatile and wide range from clean female vocals, choirs, grunts, whispers, and clean male vocals, the lyrical themes are varied based in life, death, hate, love, mental decline, etc. their music could be described as vehement transporting you into different atmospheres. While I was writing this review for some reason at one point was like listening to their album "An Elixir for Existence" released in 2004, but not quite, because "'The Seventh Life Path" has guitars more fresh, more according to the actual sound, this album opens with "Seti" an orchestration that serves as an introduction, celestial choirs are also present, the third track "Once my Light" it was the first single of this album, groovy riff, flawless drumming powerful at some time and lots of feeling in the slow parts, makes this song sinking deeper in your mind, "Elixir" has a catchy rhythm riff along the song, the keyboard add dimension to this song then comes the guitar solo by Veland definitely a good song! "Sons of the North" the longest track of this album has a terrific bass intro that will make you move then unfortunately the power earned at the beginning, fade away into an orchestral abscess, "Earendel" is an overflowing energy track rapidly all the elements are revealed really enjoyable, the interlude sounds to me like they added accordion notes, which make it interesting, "Concealed Disdain" the riff are solid and heavy, violins along the song in the background incorporate the symphonic vibe and a guitar solo well executed, "Comptemptuous Quietus" it might have one of the best riff in the whole album groovy, melodic and blunt the vocals are simply great by Ailyn, "The Silver Eye" has tremendous melody from beginning the symphonic arrangements are outstanding and the focal point are Velands growls battling Ailyn's delicate voice, the closing track is "Tragedienne" is a ballad with acoustic guitars and piano gave life to this cut slowly adding drums to make it sound memorable, here is when you can appreciate the strength and vocal capacity of Ailyn, however seems to me this cut was a leftover from their previous record and cracks the flow built along the album, nothing wrong with the song, in fact I have to admit it I like it! but surely it wasn't the end we were expecting after listen "The Silver Eye", the limited edition contains a bonus track which is “Tragica” the Spanish version of “Tragedienne”. I want to end adding few things, their seventh opus mark their return to it's former record label Napalm Records, is undoubtedly that Sirenia has found the path where they belong, the production is clear, solid so we can appreciate all the elements blending in a natural way in this album, Ailyn's voice is stoic a bit lack of power at moments, but nothing that they cannot improve for the next album, meanwhile "The Seventh Life Path" ensures them a spot in the top bands within the sub-genre.